The Amazing Spider-Man 2 does to the first The Amazing Spider-Man what that film did to the original series of Sam Raimi films. It tries desperately and far too hard to set itself apart and by doing so, becomes completely derivative to it. Director Marc Webb's superhero follow-up strangely harkens to the 1990s look and feel of comic book based movies with its treatment of manufactured villain origins and inorganic juggling of storylines. It trades in the more grounded, dark intimacy, and romance of the first for big, bright fun and broad action comedy, trying to create a larger universe that never quite fits together. The core and success of this new franchise so far is the unmistakable charm and romantic chemistry between the far too old to be playing teenagers, Andrew Garfield and Emma Stone, as our star-crossed lovers, Peter Parker and Gwen Stacy. Garfield's dopey acting and goofy yet upbeat demeanour fit the Spider-Man character very well. Because of this, TASM2 works far better as a romance and struggles between doomed lovers than a superhero's journey. What suceeds is the visual storytelling of Spider-Man, his suit, how he swings on skyscrapers, and the vision of New York City (where it was filmed entirely, a first in the franchise). 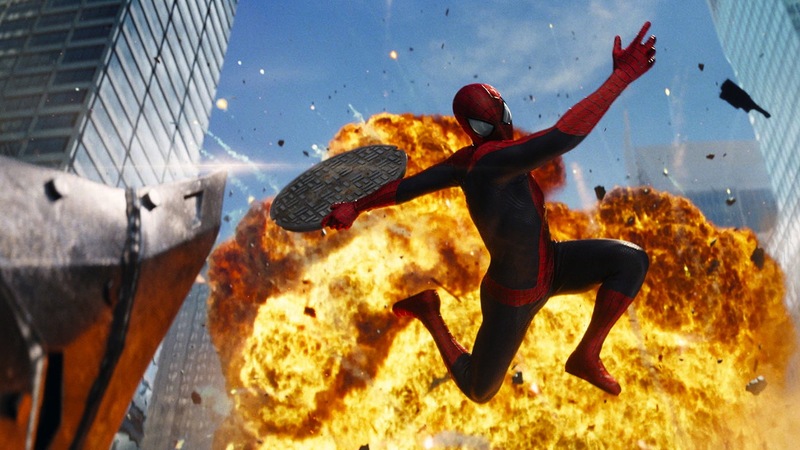 The action choreography is superbly realized and the way Spidey moves and battles is often exhilarating. This broad interpretation and landscape, while amusing and stunning in parts, sinks the overly dramatic mechanics of the film's lengthy, convoluted plot as it delves into inconsistent camp. Unfortunately, Jamie Foxx as Max Dillon/Electro is greatly underserved and never fits into the story full of coincidences where the principle characters all run into each other constantly purely in order to hit plot points. His comically dark backstory, where he comes off as a meek sociopath, is bizarre and out of a screwball comedy before an out of nowhere shift and deep hatred of Spider-Man, despite his early adoration. Much has been made of its comparison to Jim Carrey's Riddler from Batman Forever and its apt as his obsessive fan transforms into spurned supervillain in a span of a few minutes, lacking any dramatic tension. Newcomer Dane DeHaan is very compelling as the friendly Harry Osborn and villainous Green Goblin yet his rushed transformation from friend to foe is poorly developed in tandem with Electro. His connection to Peter, Spider-Man, and even his own father through the narrative are clunkily executed to say the least. Even his intense, captivatingly tortured performance can't lift the quick change. Further shoehorned into the story are Chris Cooper and Sally Field as the dying Norman Osbourne and Aunt May, along with more about Peter's mysterious parents. We're suppose to believe these supporting players' own feelings and motivations about Spider-Man's struggles but are never given enough development to see their points of view. Occasionally, Webb aims for the sky and hits the mark as he frames Spider-Man as the ultimate hero and protector of New York City. However, the film is just so wildly inconsistent, juggling far too many elements and characters of little substance. We get the idea all of the city is run by a handful of people, mostly high schoolers or employees of Oscorp with little regard for any narrative momentum other than setting up an even more bloated sequel or team-up film. Again, it continues to try to be all things to all people, fitting in every element associated with the superhero genre, and by doing so, fails to be much of anything for anyone. What really sinks the film's momentum is the questionable scripting by Star Trek writers Roberto Orci and Alex Kurtzmann alongside Jeff Pinkner. Peter and Gwen's extended scenes of naturalistic comedy and romance don't fit in with the theatrics of the big battles. The sequel doubles down on the comic book elements of fantasy and thrills where the first felt ground level and intimate. It does succeed in portraying Peter's tortured feelings about being a hero, never having enough time, as Webb plays with clock motifs mirroring how Peter ultimately ends up hurting the ones he loves most. Subverting the first The Amazing Spider-Man, number two is brighter, more fun, and livelier but tries to juggle too much, creating a universe of characters we're not yet endeared to. It's plagued with so much baggage from too many characters and past films. TASM2 meshes and mixes every superhero trope, never building its own consistent tone or mythology as it stands in the shadows of the original trilogy (particularly the excellent non-"Amazing" Spider-Man 2) and countless other films of its genre made since. It's too bad its highs are sunk by often confusing and rushed storytelling between characters not earning their moments.